This Byelaw applies inthe ‘inherited area’, which is described below only. This Byelaw applies to that part of the District within a line drawn on the seaward side of the baselines 6 nautical miles from the baselines from which the breadth of the territorial sea adjacent to the United Kingdom is measured. For the purpose of this paragraph “the baselines” mean the baselines as they existed at 25th January, 1983 in accordance with the Territorial Waters Order in Council 1964 (1965 111p.6452A) as amended by the Territorial Waters (Amendment) Order in Council 1979 (1979 11p.2866). 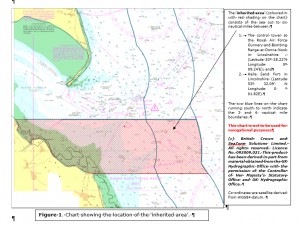 Subject to the provisions of this Byelaw trawling is prohibited within the Area of the North Eastern Sea Fisheries District. 2.3 The trawl net is raised and cleared at least once in every three hours during which trawling is carried out. For the purposes of this Byelaw the overall length of a vessel and the engine power shall be those as recorded on the vessels Certificate of Registry as issued by the Registrar of Shipping and Seamen. In that part of the District between 3 and 6 nautical miles from the baselines vessels exceeding 18.3 metres and 400 KW may be used providing such vessels are on a ‘sunset list’ maintained by the Committee. Vessels on the ‘sunset list’ shall not exceed 28 metres (overall length) and shall possess a track record of fishing within the said District for a minimum of 30 days in any three month period in the period of two years prior to the date of making the Byelaw. Vessels may apply to be placed on the ‘sunset list’ up to six months from the date of the Byelaw coming into force. Such vessels will remain in the ‘sunset list’ for so long as there is no change of ownership affecting the major shareholding in the vessel concerned. In this context ‘major shareholding’ means the largest allocation of shares in the vessel. 4.2 Any part of the Tees Estuary which lies above a line drawn from the seaward extremity of North Gare Breakwater to the seaward extremity of South Gare Breakwater. 4.3 Between a line drawn true North from the seaward extremity of the Western Breakwater at Staithes (Lat. 54o 33.81’N. Long 000o 47.35’W) out to the three mile limit and a line drawn true North East from Sandsend Ness (Lat 54o 30.76’N. Long 000o 40.40’W) out to the three mile limit. 4.4 Between a line drawn true North East from the end of Filey Brigg (Lat 54o 12.91’N. Long 000o 15.25’W) out to the three mile limit and a line drawn true East by South-half-South from the extreme South end of Filey sea wall (Lat. 54o 12.41’N. Long 000o 17.10’W) intersected by a line drawn True North East from the coastguard station at Speeton (Lat. 54o 09.37’N. Long 000o 14.48’W), out to the three mile limit. 4.5 Between a line drawn true East from Witter Hole (Lat. 53o 58.46’N. Long 000o 11.77’W) out to the three mile limit and a line drawn true East from Spurn Head Lighthouse (Lat. 53o 34.49’N. Long 000o 06.65’E) out to the three mile limit. For the purposes of this Byelaw the three mile limit is defined as a line drawn on the seaward side of the baselines 3 nautical miles from the baselines from which the breadth of the territorial sea adjacent to the United Kingdom is measured. For the purpose of this paragraph “the baselines” mean the baselines as they existed at 25th January, 1983 in accordance with the Territorial Waters Order in Council 1964 (1965 111p.6452A) as amended by the Territorial Waters (Amendment) Order in Council 1979 (1979 11p.2866). ALL POSITIONS RELEVANT TO THIS BYELAW ARE SATELLITE DERIVED FROM WGS84 DATUM.